NFL: Do the New York Jets Even Have a Chance This Year? In preparation for this Jets preview, we were fully prepared to talk about the ceiling of a good team without good quarterback play. The 2000 Ravens and 2002 Buccaneers were exceptions to the rule, not an archetype (and by the way, for those who’d bring up those teams, Trent Dilfer and Brent Johnson weren’t prone to turning the ball over). The irony, of course, is that in light of recent events – which is a lesson to never, ever put your finger in someone’s face if you happen to owe them more than a couple bucks – the Jets arguably saw their quarterback situation improve a little bit, with anyone aside from Geno Smith taking the starting gig while his jaw heals. If you were wondering what the Jets were going to be like in the Todd Bowles era, after the loud, proud Rex Ryan years, today’s episode is an inauspicious indicator. The truth, though, is that they were already shaping up to be a carbon copy of what they were in the Ryan years: a strong defensive team that would rely on the run and hope its quarterback, presumably Geno, didn’t make a mess of things. When you consider that they might not even be the biggest defensive bully in the division, a distinction that probably belongs to Buffalo now, and almost definitely not the top contender to the Patriots in the AFC East, the Jets’ accelerated rebuild might have been greatly exaggerated. Whether their chances took a hit or received a boost as a result of the $600 megaton punch, one thing is a given: the Jets won’t be boring. IN: (via the draft) — DE/DT Leonard Williams, WR Devin Smith, DE/OLB Lorenzo Mauldin, QB Bryce Petty, G Jarvis Harrison, DT Deon Simon. (via free agency and trades) — QB Ryan Fitzpatrick, RB Stevan Ridley, WR Brandon Marshall, OT Corey Hilliard, OT James Brewer, G James Carpenter, DE/DT Stephen Bowen, DE/DT Kevin Vickerson, ILB Erin Henderson, ILB Jamari Lattimore, ILB Joe Mays, CB Darrelle Revis, CB Antonio Cromartie, CB Buster Skrine, S Marcus Gilchrist. As has been the case for several years, stretching back even before the Rex Ryan era, the Jets’ passing attack remains miserable. It’s a law of nature, just as constant as gravity. They were dead last in 2014, 31st in 2013, and 30th in 2012. So, with respect to Jets superfans like Mike Greenberg, was Geno Smith getting socked really the worst thing that could have happened for the team’s prospects in that regard? A Jets team that ranked 3rd running the football boasts an O-line that will be at least as good, if not better, and in spite of the fact that Chris Johnson, Percy Harvin, Michael Vick, and Smith accounted for 1164 yards collectively (all are either gone or mending broken jaws), Stevan Ridley and starting back Chris Ivory should be able to shoulder the load. If there’s one area for the line to improve, it’s in reducing the 47 sacks the team yielded last year, although some could be attributed to having had two running quarterbacks in 2014 who have a tendency to extend the play by scrambling in the backfield. With Ryan Fitzpatrick (or anyone else), the Jets definitely lose the running dimension from their quarterback spot for the conceivable future, but they also get a guy with a bit of a vertical touch who may be able to make better use of Brandon Marshall, Devin Smith, as well as Eric Decker and Jeremy Kerley. The great weakness of the Jets passing offense is still the masquerading of Jace Amaro and Jeff Cumberland as legitimate NFL tight ends. As far as the oft-praised defense, the Jets came in a solid 6th overall, 5th against the run but only 14th against the pass. To that end, they have overhauled the secondary by bringing back former stars Revis and Cromartie, as well as adding Buster Skrine. As for their pass rush and run stopping, the major coup was grabbing Leonard Williams in the draft, ensuring that a team that ranked 6th with 45 sacks has a chance to improve upon that mark. All in all, however, turnover differential was an undoing of the Jets last season, as they managed just six interceptions (tying a league low) and seven fumble recoveries as a team for 13 total turnovers (also tied for a league low) while giving back 15 picks and nine fumbles. The Jets had three major failings last season, two of which they tend to have almost every season: an inability to move the ball through the air, turnover-prone quarterback play, and last season, major struggles in generating turnovers. Working backwards, it seems as though their defensive changes should lead to them at least getting the ball back more often than they did in 2014. And Ryan Fitzpatrick hadn’t been the poster child for reliable, mistake-free quarterbacking before last season, but assuming he can continue his safer ways, the Jets could be 2015’s version of last year’s Texans. 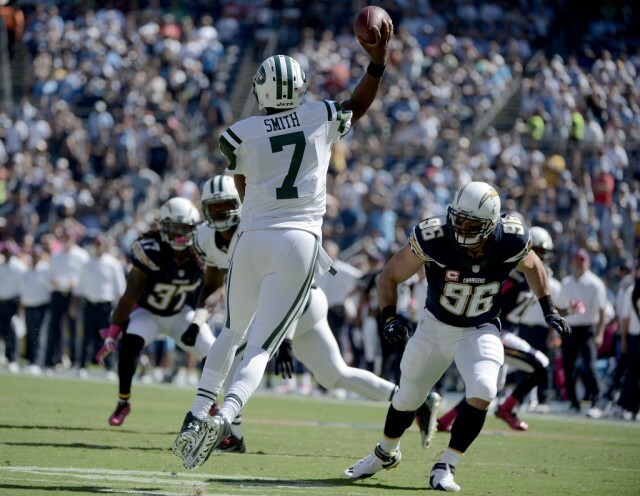 Lastly, Fitzpatrick did have a six touchdown game in Week 13 against the Titans, but he otherwise actually passed for fewer yards than Geno Smith last year (2525 to 2483), albeit in two fewer games. The point is, that number doesn’t project to him automatically turning the Jets into a juggernaut. Ironically, that may be the best thing for this team long-term, because the Geno experiment has been a disaster and Fitzpatrick is essentially a temp. Bring on Petty boy! Prediction: A schedule that includes matchups against Cleveland, Washington, Oakland, Jacksonville, and Tennessee gives the Jets a slate of games where they could reasonably expect to be favored. Throw in two each against Buffalo and Miami, a Houston, a Philadelphia and a Giants matchup and it’s easy to see where, outside of probably Dallas, Indianapolis and two games against a Patriot team with a reinstated Tom Brady, there aren’t many games where the Jets will be up a creek. We’ll give credit to the fact that Todd Bowles was a credible, respected coordinator and ought to be a solid coach and the fact that this roster is actually pretty decent. With that said, let’s go ahead and say that the Jets’ over/under is 9-7, and could easily clear into the over.